Dazzlegloss3: Lust Have it! Australia's Beauty Subscription Service. Lust Have it! Australia's Beauty Subscription Service. Sorry for not being able to post anything recently. I actually met with a small accident and I am still recovering. But on the brighter side I have some great news for all of you. Most of you may know or would have heard of Lust Have it! in Australia, it is basically a beauty box subscription service which delivers 5-6 sample beauty and skin care products each month to your doorstep. I was initially subscribed to Glossy Box back in 2011 and eventually Lust Have it! took over Glossy Box which made me continue my service with Lust Have it! Samples are great to test a product if it suits you and for traveling. I use most of my samples for traveling because they don't take too much space. I have always enjoyed trying out new brands and using different products and this service provides that. There have been so many products that I tried, only because they came in my Lust Have it! box and have fell in love with. I would have never bought them on my own and a lot of them I didn't even know existed. Each month you get deluxe samples of 5-6 products that you can try out and see if it works for you. I have gotten at least one full size item in almost all my boxes, which covers the cost of the box itself. Till date I have received products from Benefit, Lush, Marc Jacobs, Face of Australia, Models Prefer, Tigi, L'oreal, Sheer cover, Dermalogica, Avene, Naked Tan, Mirenesse, Jurlique and Bioderma to name a few. 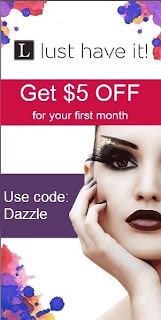 The cost of subscription is $19.95 each month for the Women's Box and the best thing about this is you can cancel anytime.If you use my coupon code DAZZLE you get $5 off the first month. Try it out!!!! For $14.95 you are definitely going to get products worth more than that. I will be honest and say that I canceled this service in February this year due to traveling overseas and moving houses and jobs. But I have joined them again and I will be continuing this service. I am so excited to try out a lot more new products!!! Click on the picture below and go get your Lust Have it! box. Disclaimer: I am not paid to review the above mentioned company. All thoughts and opinions are my own.